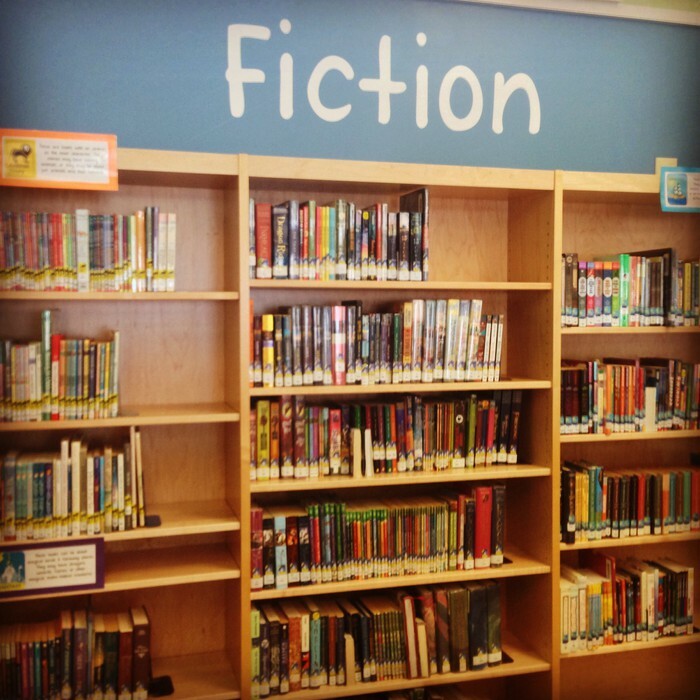 As we enter our third week of school and are settling into our routines, I'd like to share with you some exciting changes to our library, special events coming up, and information that will be helpful to you throughout the school year. Grab a cup of tea and enjoy! Visit the Lower School Library website for links to checkout procedures, library collection and curriculum, reading programs, annual reports, research resources, and much more. Students will become familiar with this website throughout the school year as their portal to research and reading resources. 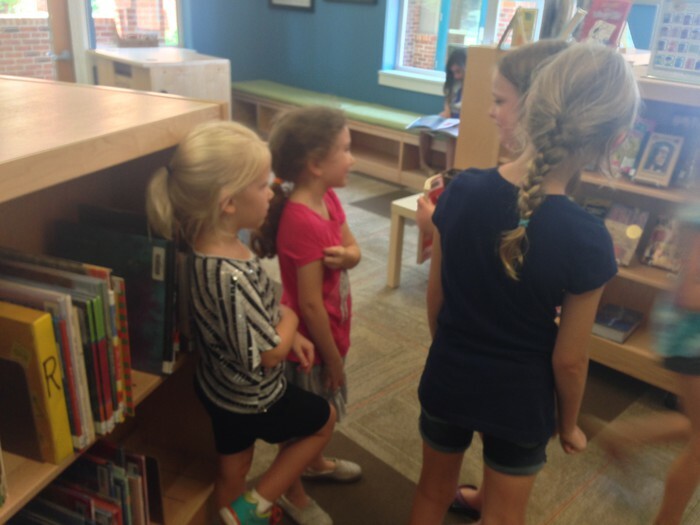 Students spent the first two weeks of school exploring the library, on their own at lunch recess and with Natalie during library orientation sessions. Mountain and Forest students went on a scavenger hunt to learn the new genre sections in fiction while Sky and River students learned to use shelf markers and how to care for their books and the library. 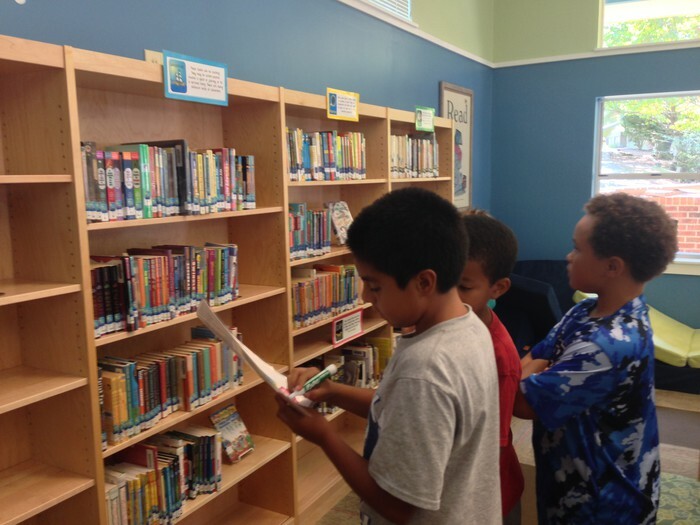 Starting this Monday, all students will be able to check out books! Please take the time to ask your children about their library books and designate a safe spot at home for those books. Books check out for two weeks at a time. You will find a due date slip at the back of the book with the date stamped on it - this is when it should be returned. Feel free to email Natalie if you have any questions! 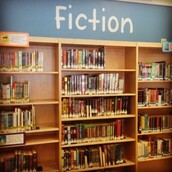 Over the summer, the fiction section was completely revamped! 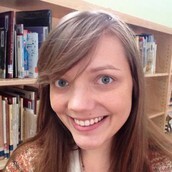 Originally organized by author's last name, Natalie broke down the fiction collection into nine genres for students to explore. 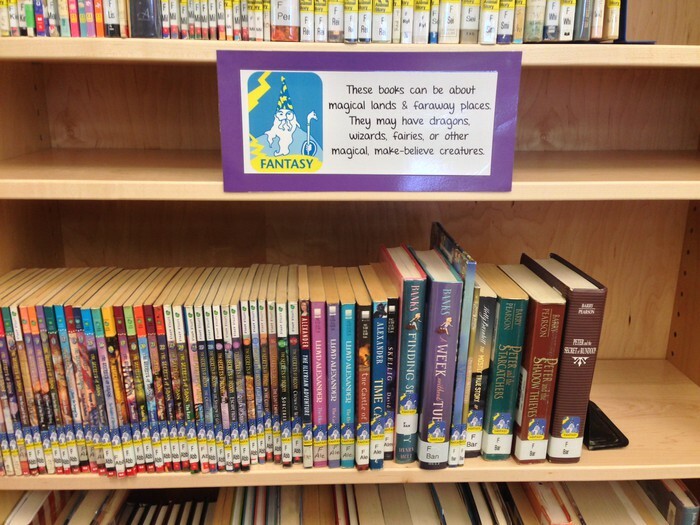 Books are still alphabetized by author within a genre, but the smaller sections will allow students to browse better and find similar books more easily. Students are already identifying their favorite sections and sharing with friends! The Lower School is having a book fair! We are excited to bring back the Bedford Falls Book Fair, an independent, family-owned company based in Raleigh. The book fair will be held in the LS Library next Monday - Friday (Sep. 19-23), open from 8am - 3:30pm. If you're coming before school, please stay with your child until 8:20am. The book fair will also re-open at 6pm on Thursday for Back to School Night. All purchases made at the book fair will help support the LS Library. This is a great chance to get your holiday/birthday shopping done early! If you are able to help out either before or after school, please sign up here. 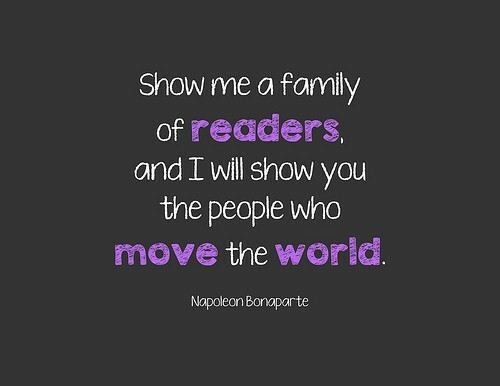 Volunteers will help students and families find books and/or handle purchases. Here's a sneak peek at what books you can expect to find at the fair! CFS and Durham Academy Lower School Libraries are teaming up for a StoryWalk at the Eno River State Park on Sunday, September 25th from 2-4pm. 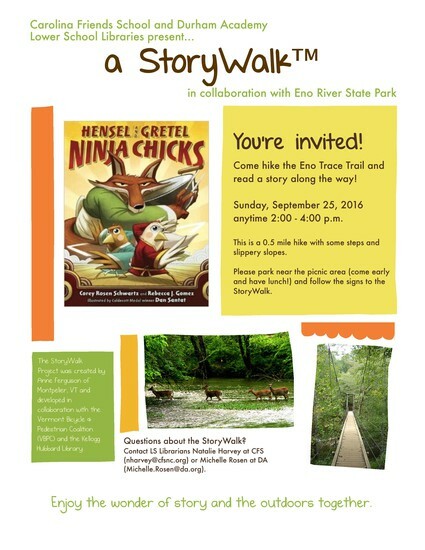 Families from both schools are invited to hike the Eno Trace Trail and read Hensel and Gretel: Ninja Chicks by Corey Rosen Schwartz along the way. See this flyer for more information. Hope to see you there! If you'd like to volunteer at the LS Library, we'd love to have you! The library is a busy, bustling place most days and could use dedicated volunteers to keep it tidy and running smoothly. Check out our Volunteer Match ad if you are interested! We appreciate and consider donated materials that meet our selection criteria as outlined in the LS Library Collection Development Policy. If the donated books are in good condition and fit the needs of our community, we are happy to add them to the library! 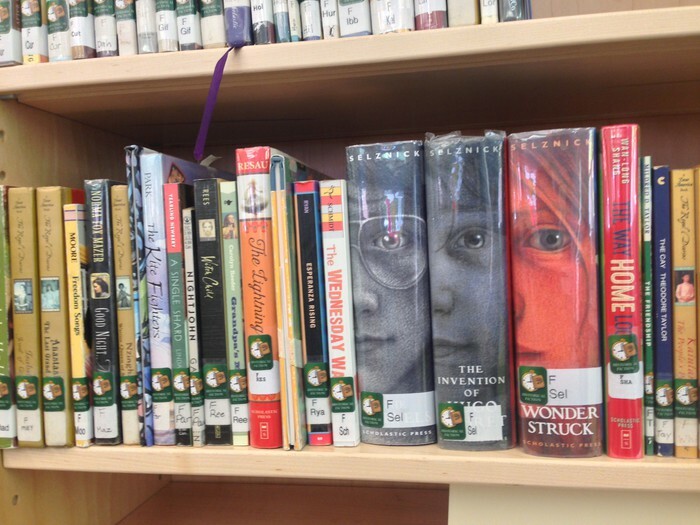 Books not added to the library will generally be donated to classrooms, the public library, or Book Harvest. Thank you for thinking of us!